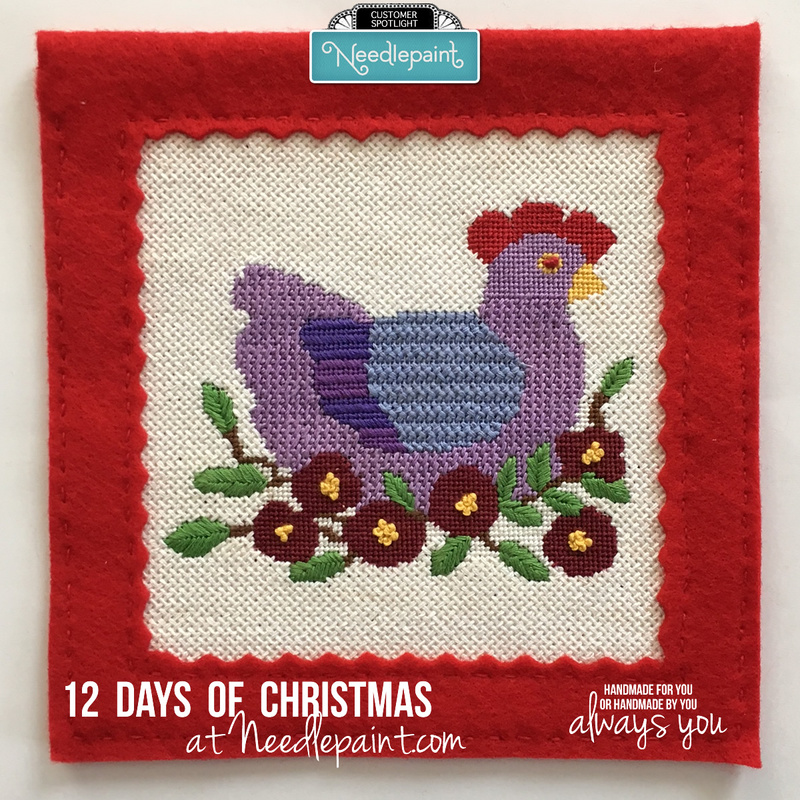 NeedlePaint Perfection — A Beginner Shares Her Creation! 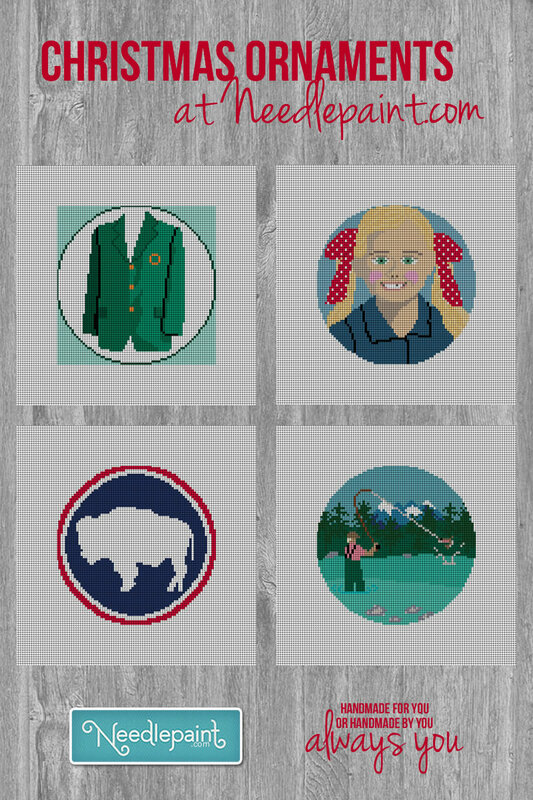 About two weeks ago we featured customizing our Fun Kids Name needlepoint pillow canvas. Much to our surprise this week, at NeedlePaint we received the most beautiful photos of what Paula from Pittsburg, created with not just one, but two canvases with this design! 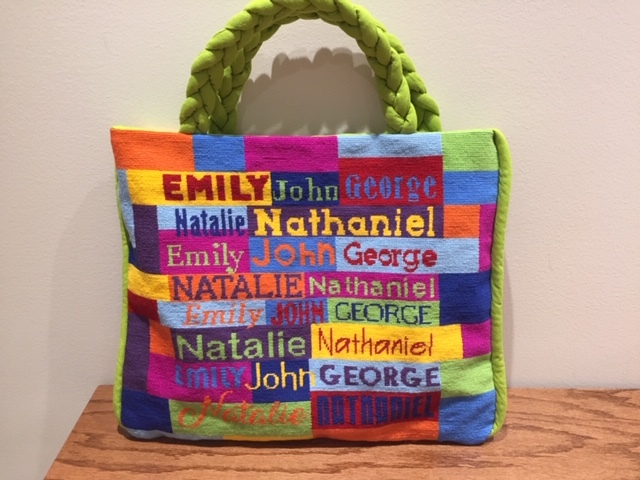 Paula created this tote for her personal use; featuring her grandchildren’s first names. She is using it to carry around her sewing projects. 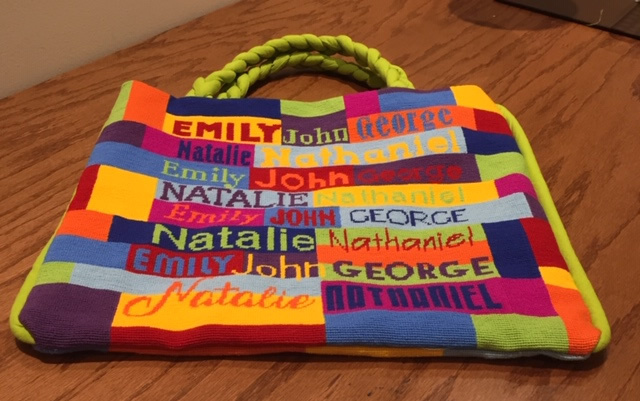 Take a close look at the front and back of this tote, as Paula has used different colors on each side, not to mention she sewed and finished this tote herself. Paula has been sewing since the age of five, and learned from the best . . . . her grandmothers were both creative seamstresses and taught her how to sew doll clothes. She has been sewing her own clothes since she was in the ninth grade, and also loves embroidery, cross-stitch, knitting and crochet. WOW! 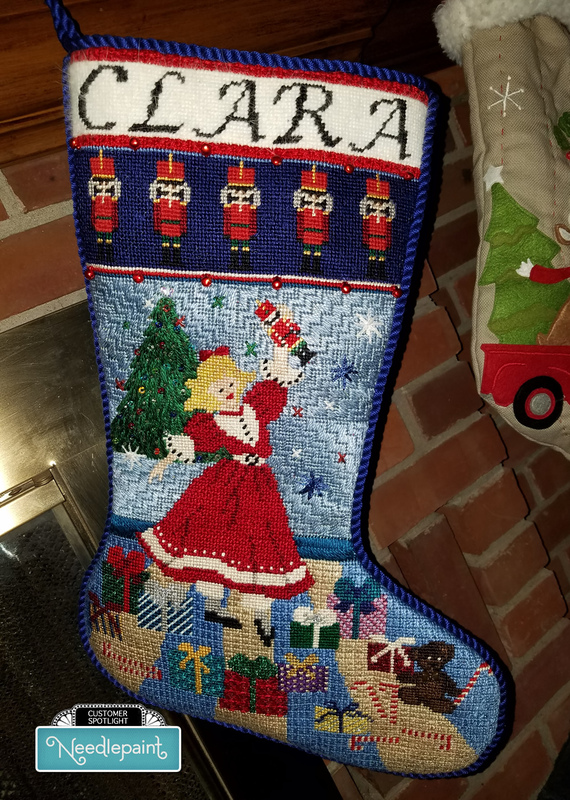 I found out this was Paula’s first needlepoint project. She will add needlepoint to her list of crafting, but would like to try a different project next time. “I like trying things I’ve never done before”. 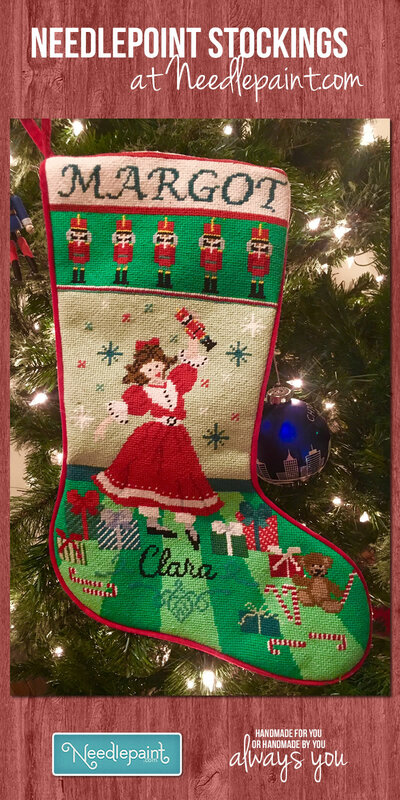 A beautiful needlepoint creation Paula; thank you for sharing your truly amazing example of “NeedlePaint inspiration”! 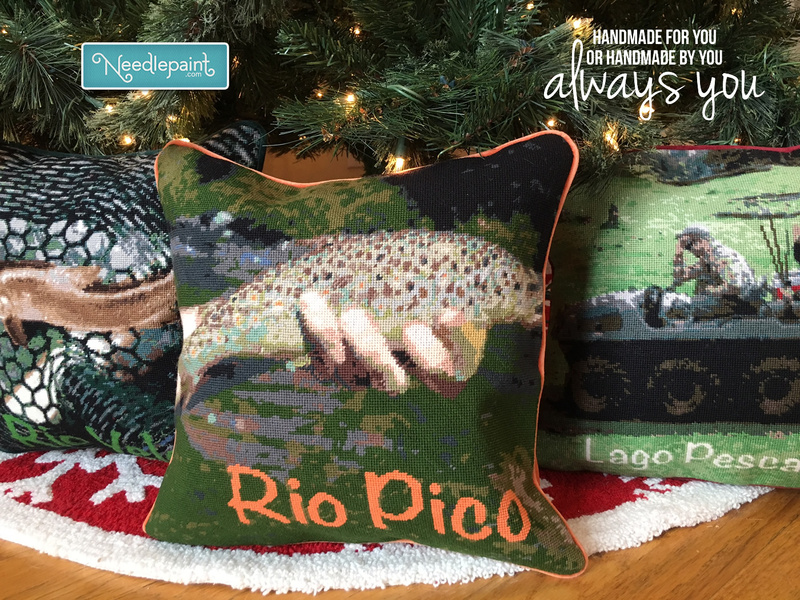 We love to see what you have been stitching, please feel free to send us your creation photos at: info@needlepaint.com. The French hens were just too plump to put all three on the block so we only have one, sitting fat and happy on her flowering nest. No eggs in view! 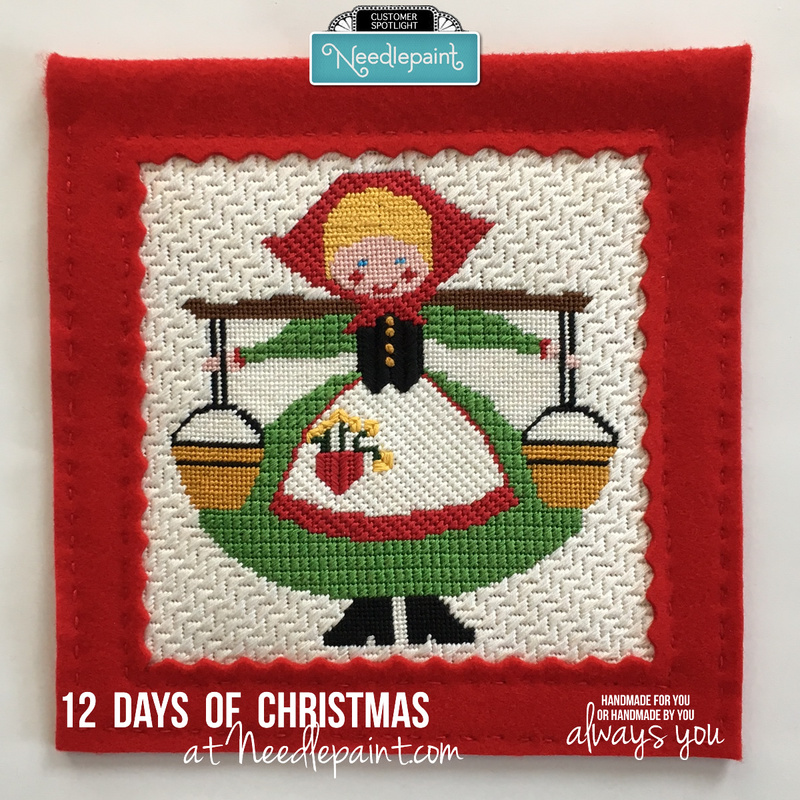 All but one of the stitches for this and the next block can be found in The Needlepoint Book by Jo Ippolito Christensen. 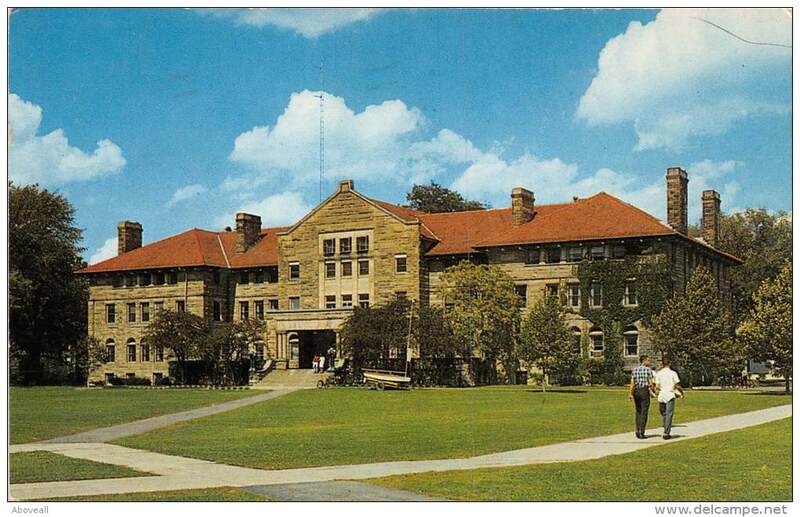 However, some are worked in different directions than shown in the book. The head of our lonesome hen is stitched in Continental as are her comb and beak. 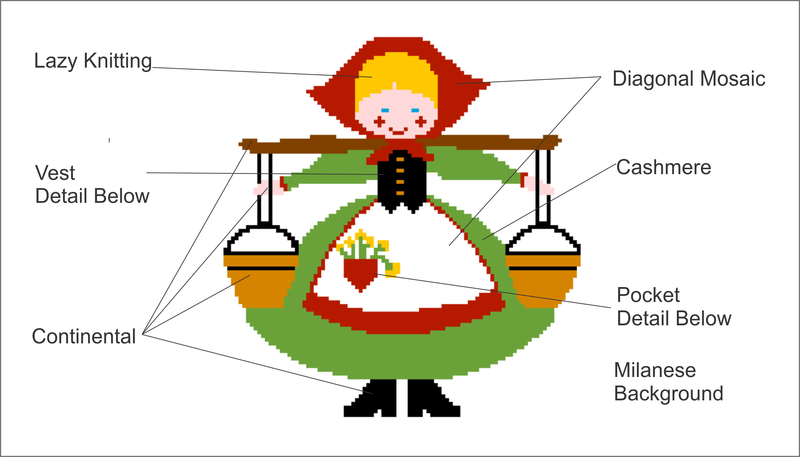 Her eye is a French Knot. 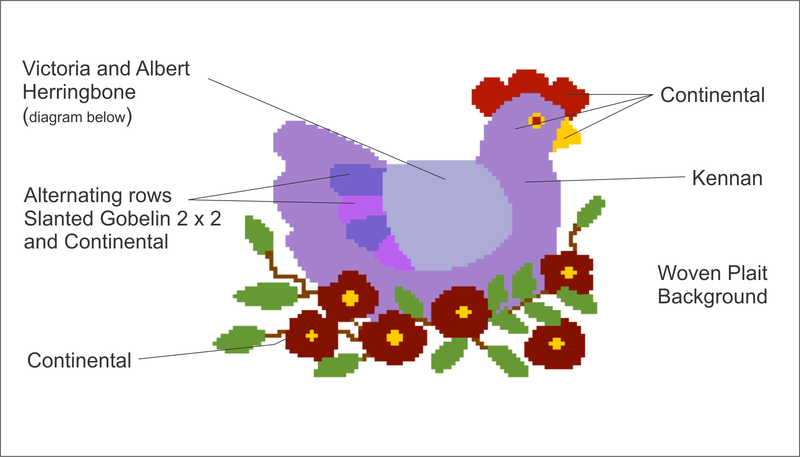 Her breast and tail are Kennan and the wing tips are alternation rows of Slanted Gobelin 2 x 2 and Continetal worked slanted from top left to right. 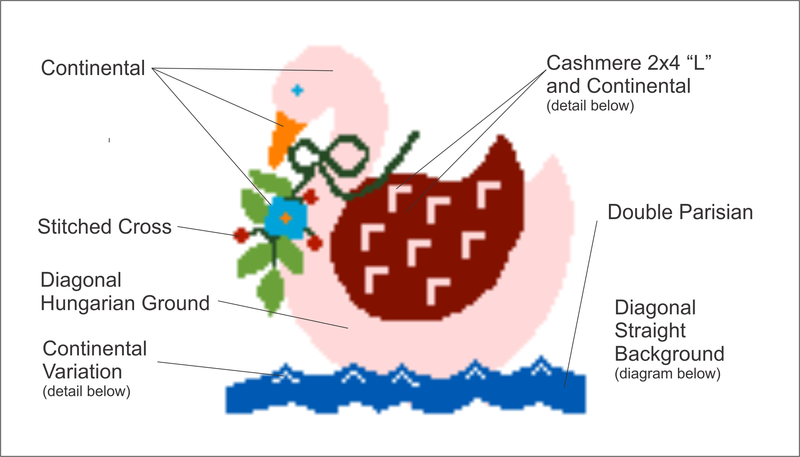 Flowers are Continental with their centers done is varying numbers of French Knots to fill the canvas. 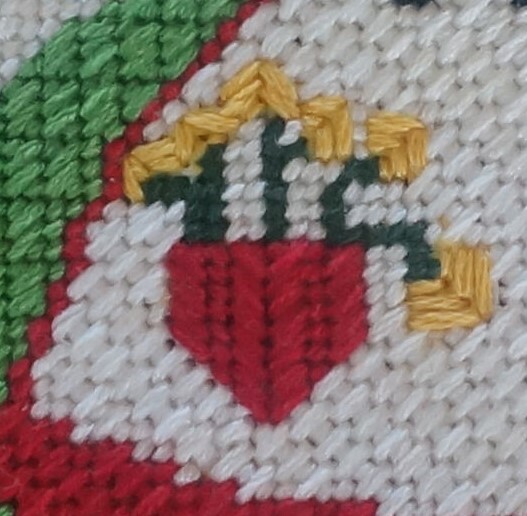 The branches are Continental as well, and the leaves are done in variations of the leaf stitch. The hen’s wing is done in Victoria and Albert Herringbone, show below. It is a variation of the standard Herringbone was adapted from a Victory and Albert Museum Handbook of embroidery stitches by Sherlee Lanz. 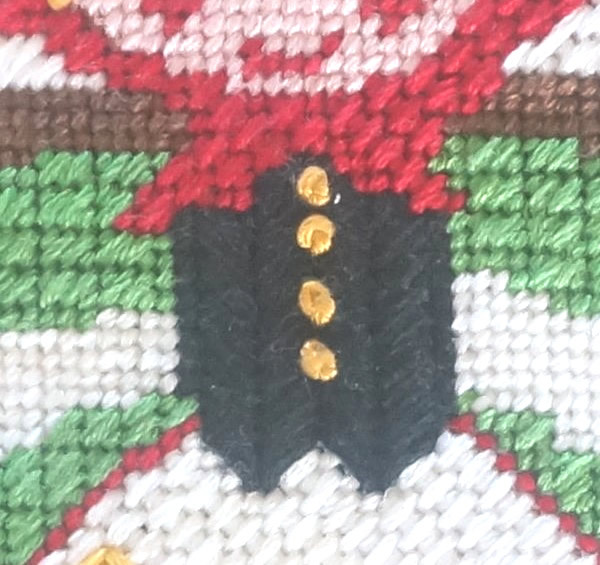 Background is Woven Plait which is similar to and simpler than the Victoria Albert Herringbone. The Woven Plait is a quick background stitch that has texture. 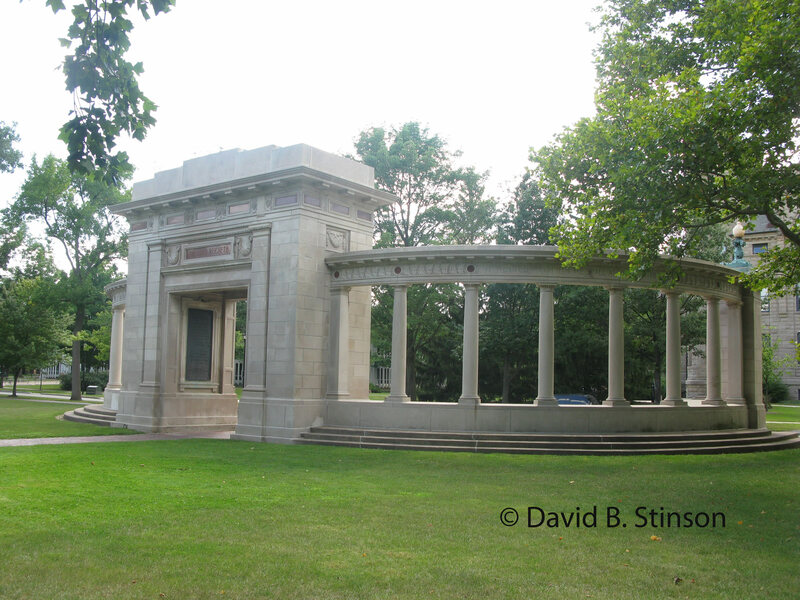 The Four Calling Birds block is the other symmetrically designed block. 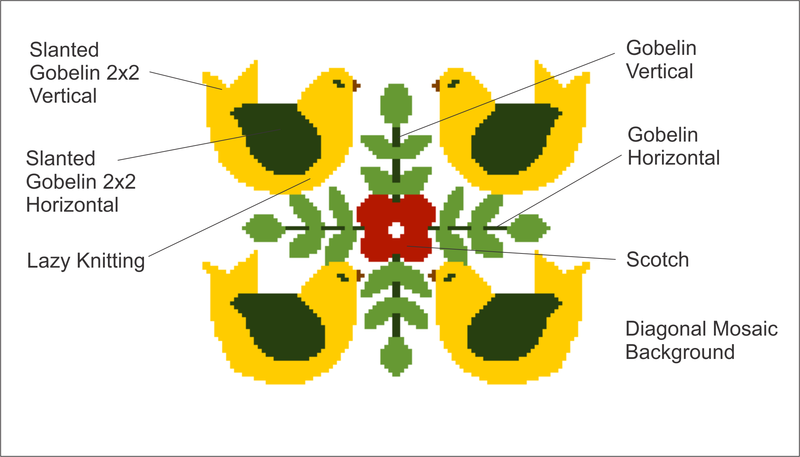 The yellow of the birds is done in Lazy Knitting, worked left to right on the left half and right to left on the right. 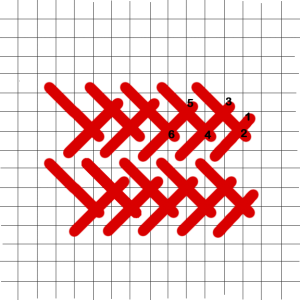 The same is true for the Slanted Gobelin 2×2 of the tails and the green Slanted Gobelin 2×2 of the wing. Lazy Knitting is one of the more tedious stitches, but contrasting texture to the Slanted Gobelin makes it worth the effort. The flower is done with 4 Scotch squares on each petal. It is edged in Satin to round out each petal. The flower center can be stitched in white Continental, or yellow French Knots or maybe some beads? There are possibilities on all or the blocks to add some flare with beads and/or sequins. Flower centers and eyes are obvious choices for these types of embellishments. 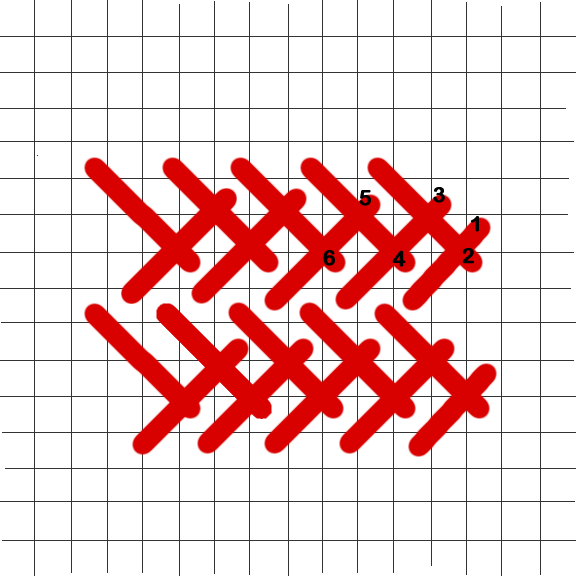 The background is the Diagonal Mosaic, not to be confused with the Mosaic stitched diagonally. 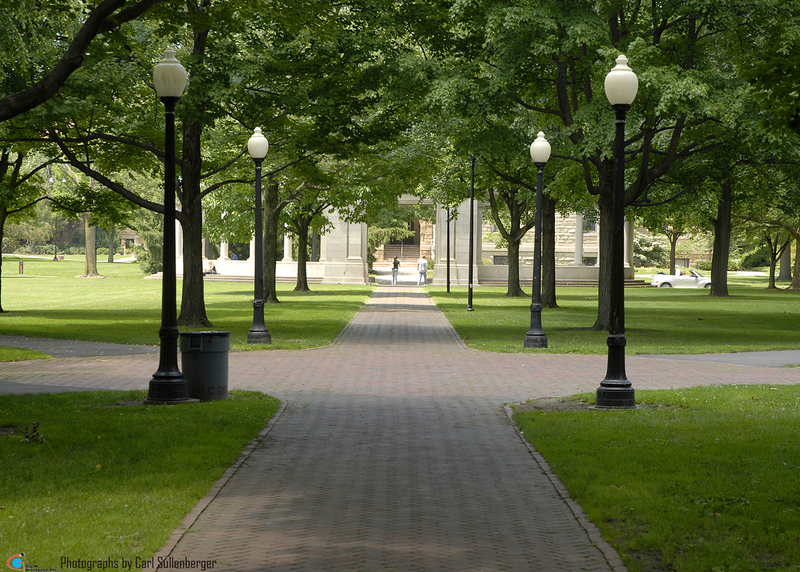 Unlike the background of the Two Turtle symmetrical block, this background is worked continuously across the entire block. That is not stitched in opposite directions on each half. Coming up a break from birds…. Five Golden Rings, the most complex of the 12 blocks! 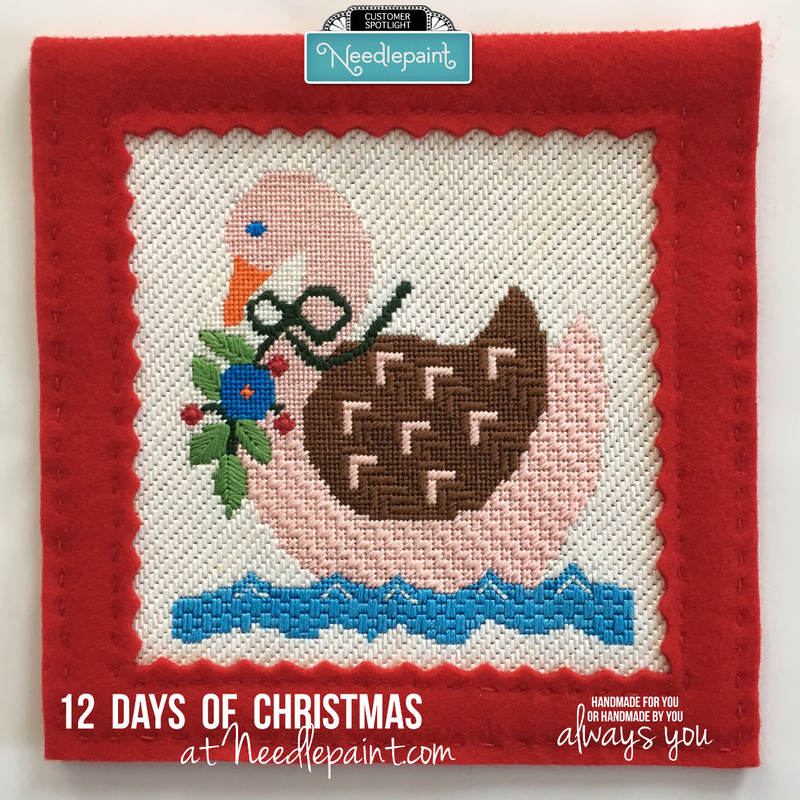 Needlepaint’s 12 Days of Christmas needlepoint canvases were inspired a quilt my mother made 25 years ago. 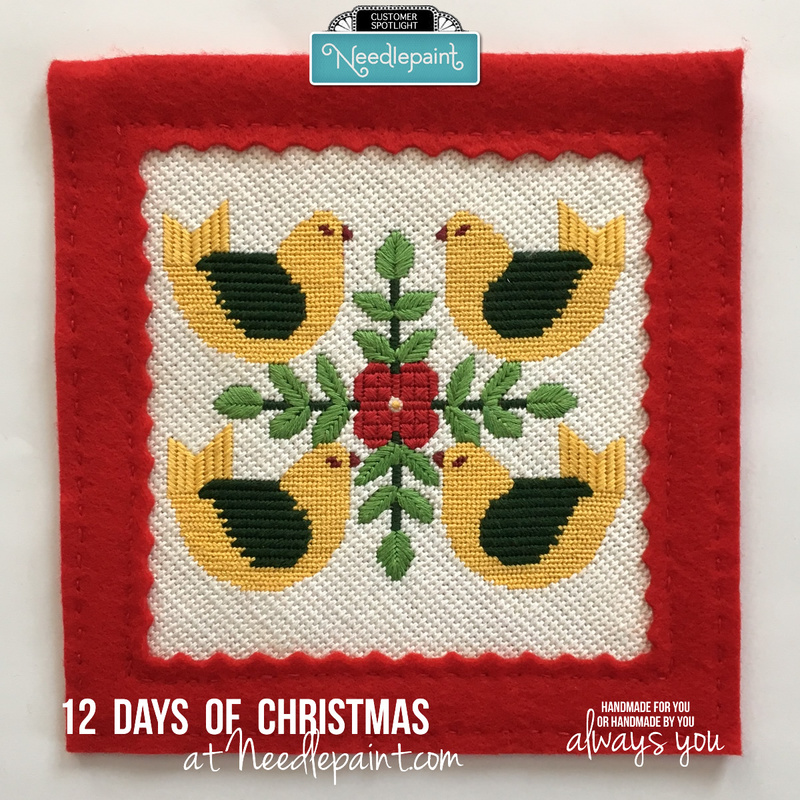 Use the 3-inch circular, 18-point ornaments to decorate a tree or the 6 x 6-inch 18-point blocks to hang as a bunting (8 x 8 inch on 14 mesh). 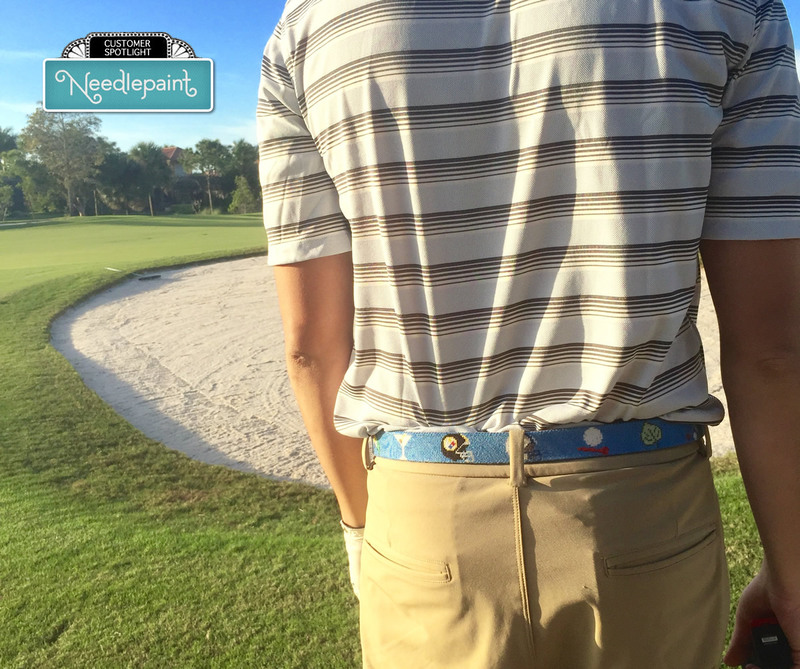 They are an ideal size to be done while traveling, waiting in a doctor’s office, or babysitting a sleeping grandchild. Or, in the tradition of a quilting bee, canvases can be done by several different needle-pointers. 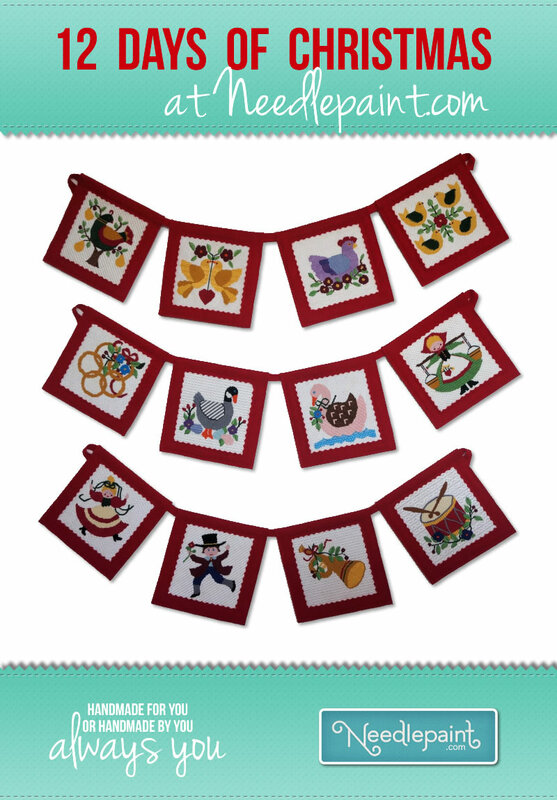 I stitched and finished the bunting……. 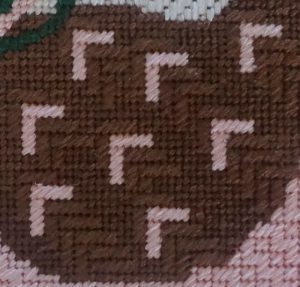 The blocks can be stitched with the continental stitch However, I used a variety of stitches using DMC 6-strand floss.Quick-cover stitches for the backgrounds sped up completion and others I chose to provide texture. (Stitches will be described in subsequent blogs.) Beads, sequins, and/or ribbons could also be added for textures and highlights. 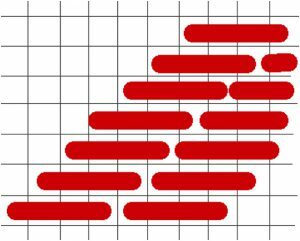 Finishing and display options are numerous… If one has a large wall space or fireplace, a 12-block bunting would be cool, but it is easier to find a place for a shorter 4-block 3 string display. 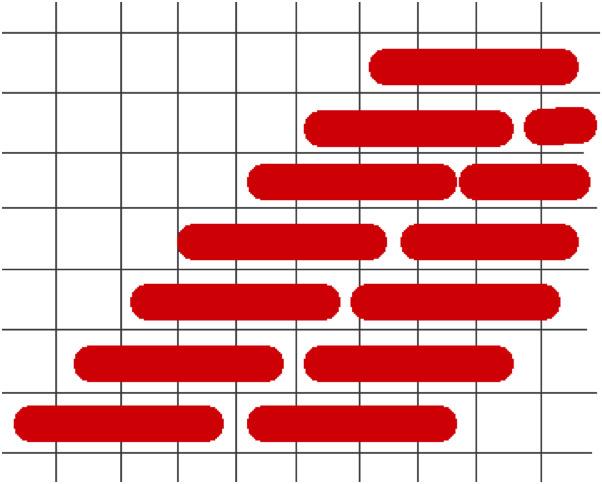 Also, consider a 2-block 6-string or 3 strings of 3 blocks, 4 blocks, and 5 blocks. 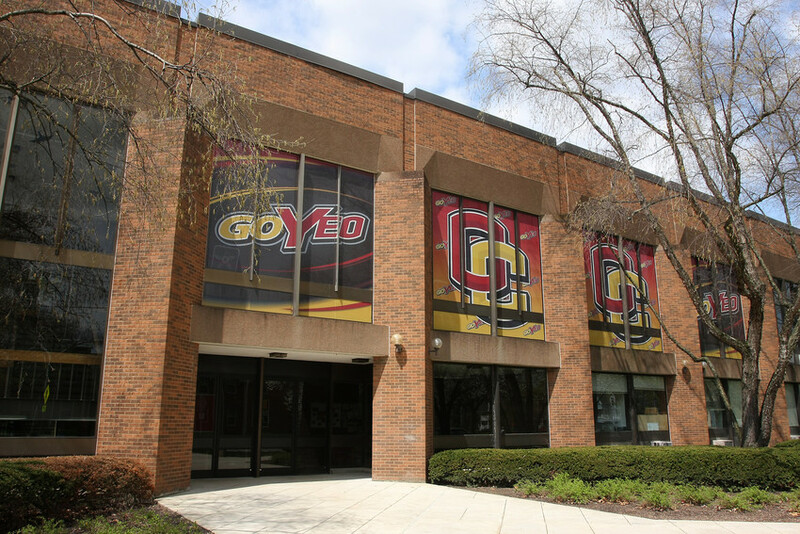 In the photo above, the blocks are framed and backed with red felt, hand-stitched together with 3 strands of red DMC floss to match, and strung on a ¾-inch strip of felt. If you are not into buntings, the blocks could be used to decorate a table or sewn together for wall hanging or table runner. Each could be framed in the Mill Hill Wooden 6 x 6-inch frames which are designed for needlework and available online from several vendors, including JoAnn or Amazon. 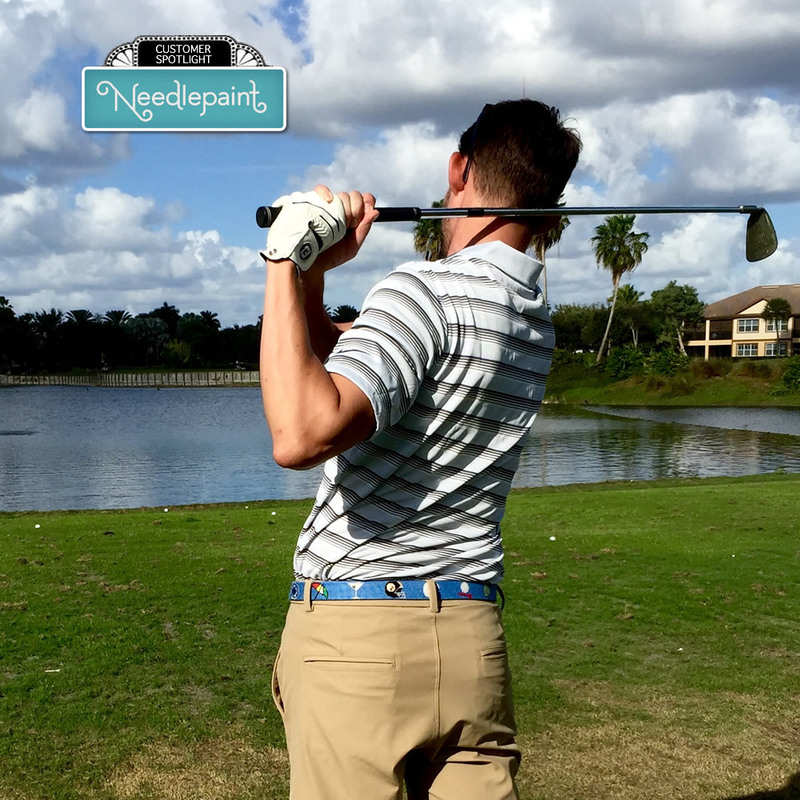 Detailed directions and alternatives for finishing will be addressed in a later blog. We’re approaching Christmas again, and I wanted to let you know our timeline this year. 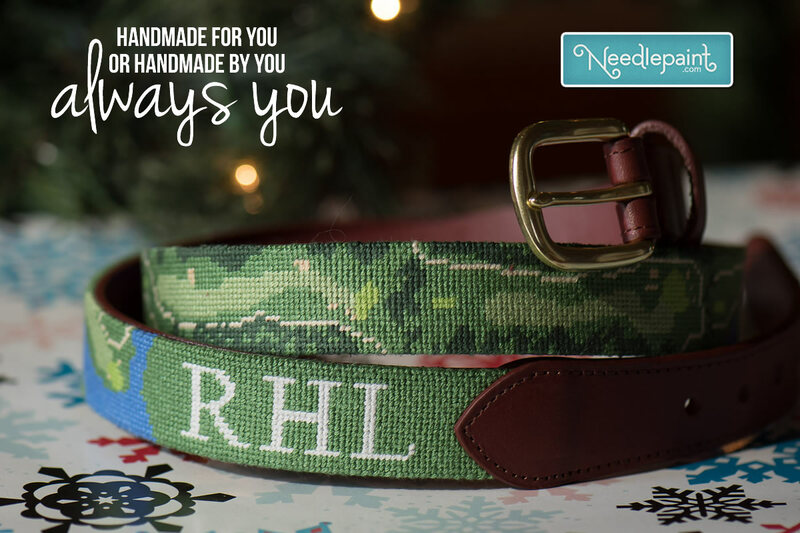 Fully Stitched Needlepoint Belts, Wallets, Dog Collars, and Flask – orders must be placed by November 1st. 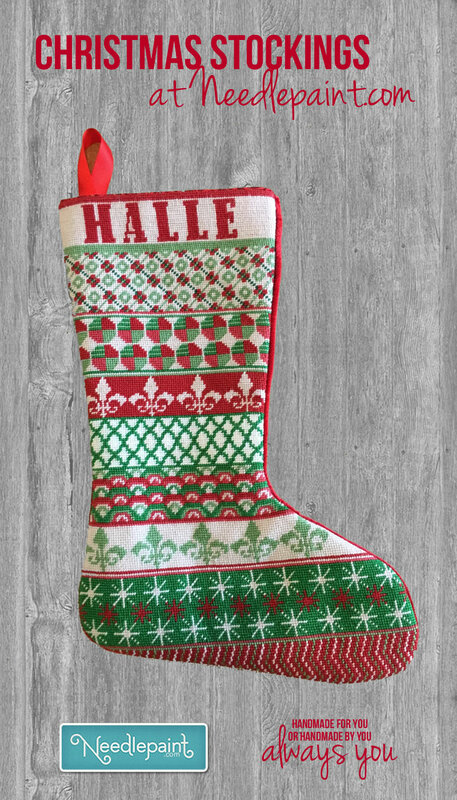 Fully Stitched Pillows and Stockings – we cannot finish any new projects before Christmas. 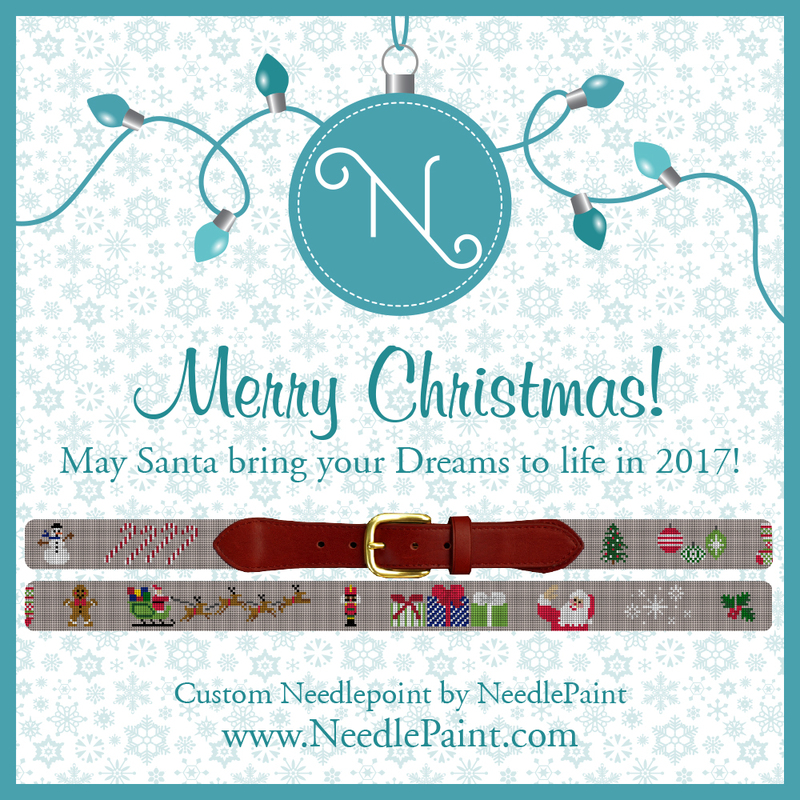 Needlepoint Kits and Canvases (stock designs) – December 12th for free shipping, and Dec 19th for an extra fee. Hanukkah = same as Christmas this year! 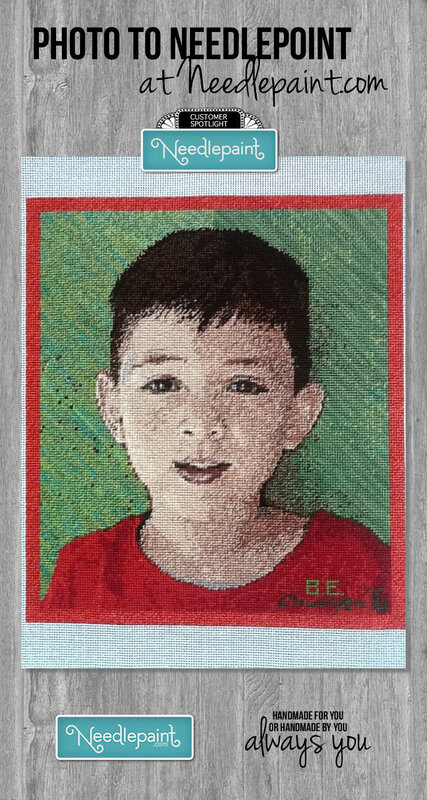 The first project comes from Chunyen in VA. She stitched an amazing portrait that she custom designed on our website NeedlePaint.com, she did not skip any details! Nice work! 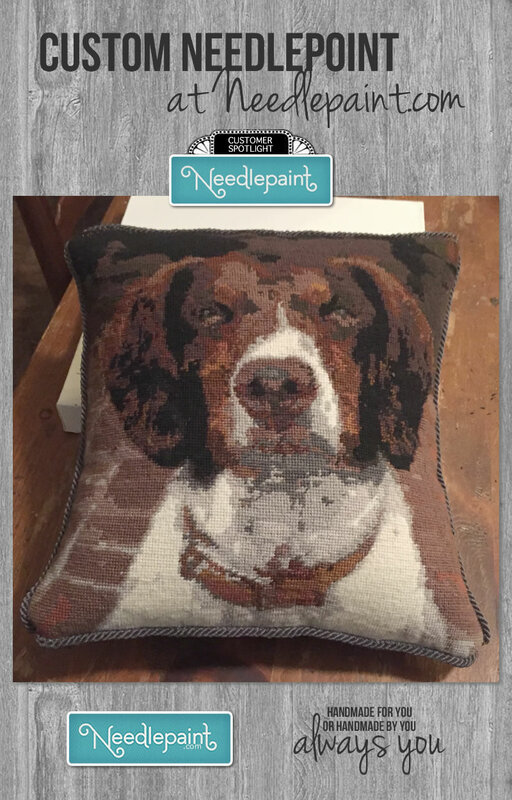 Next is a dog portrait turned into pillow by one of our customer’s mothers! Stunning!